RIO DE JANEIRO, BRAZIL – Yesterday (January 3rd) the regular season of the American NFL (National Football League) ended and now the 2016 playoffs start, leading up to the Super Bowl on February 7th. Yet fans should know that this time of year watching NFL games in Brazil is a little more complicated, because the daylight savings time changes in October put Rio three hours ahead of the U.S. Eastern Standard Time (EST). Blue Agave in Copacabana is ready for the crowds to come and support their favorite team in the 2016 NFL Playoffs, photo by Blake Sherman. That makes the 1PM kick-off on the East Coast of the U.S. start at 4PM in Rio, and perhaps more importantly drives the night games into late affairs. Next weekend has a Saturday late game (Steelers and Bengals) which will start at 11:15 PM, and not likely to end before 2AM. Still the NFL has been easier to follow in Brazil in recent years, as the major Brazilian cable networks are airing more games on their Sports channels, and with new audio technology it is usually possible to switch to the English-language commentary. Also with the high-speed internet connections now available, live streaming options like the the official NFL Game Pass (available outside the U.S.) make it surprisingly affordable. 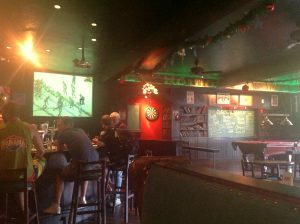 Still, it is hard to beat watching a game at a bar with old and new friends, and luckily Rio has several options. The best are predictably American-expat owned, like the Blue Agave bars (in Copacabana and Ipanema) and the newly named Lucky Screw American Irish Bar in Copacabana. Shenanigan’s opens early and has one of the largest screens to watch the NFL games when they are broadcast locally, photo by Jay Forte. 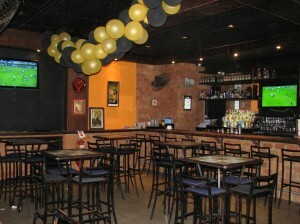 Another main-stay for watching the NFL in Rio is Shenanigan’s Irish Pub & Sports Bar in Ipanema. The bar was opened over thirteen years ago by a group of American expatriates, but in 2012 was sold to Brazilian owners who fortunately continue to make showing the NFL games a priority. For those who want to sit outside and watch the games in the shade, then Mab’s on Copacabana Beach is a great option, also owned by an American expatriate. There are also a few other locations that will show NFL games on occasion, such as the Gringo Cafe, Lord Jim’s Pub, Banana Jack’s and the Mud Bug.